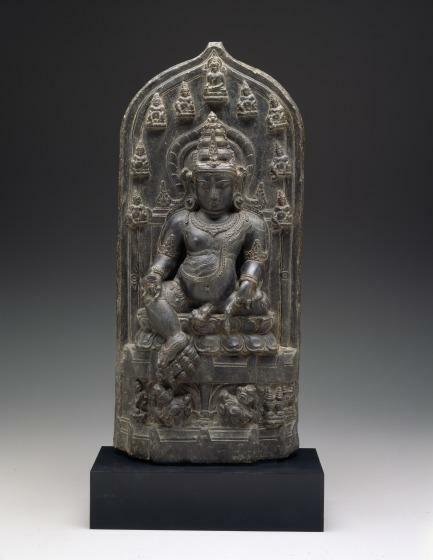 This Pala-dynasty stele depicting Jambhala reflects a mixture of Hindu and Buddhist influences. 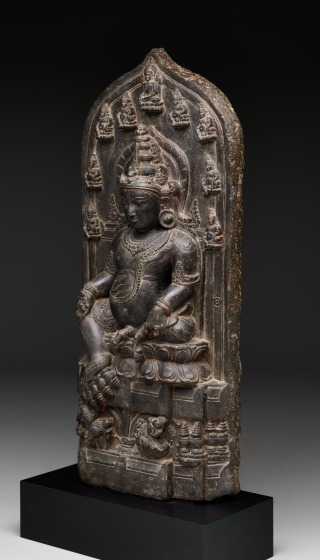 The Buddhist deity Jambhala is associated with Kubera, the Hindu god of wealth. As Kubera, he is recognized both as the king of yakshas and as one of the eight directional deities, the one presiding over the northern region. Jambhala is a popular deity not only in eastern India but also in Nepal and Tibet. 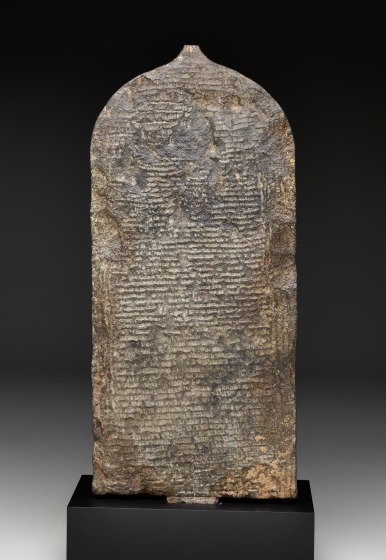 This stele would have been set into an architectural niche as part of a temple. In this representation, Jambhala, like Kubera, appears slightly obese and dwarfish. Kubera began as a demonic figure, who controlled the sources of gold and jewels in the Himalaya mountains. When he came to be worshipped as a god of prosperity and good fortune, he still retained the earlier grotesque demonic features. Jambhala is shown with his foot on money pots and holding the nakula, or mongoose who spits out jewels. The assimilation of this god to Buddhism is indicated by the eight-fold emanation of Jambhala overhead, surmounted by Shakyamuni, the historical Buddha. The god is richly clothed and ornamented with jewelry. Although these worldly features seem at odds with Buddhist detachment from the world, they are common in images dealing with the mundane world. The figure of the donor on the base also refers to the human sphere. The art of the Pala dynasty of Bengal and Bihar in eastern India (8th-13th century CE) was one of the central art styles of medieval Hinduism, building on earlier Kushan and Gupta art. Although Buddhism was declining in its homeland of India during this period, the Pala kingdom included several of the most sacred sites of Buddhism, including Bodh Gaya, where the Buddha achieved enlightenment. Further, Pala kings provided funding for the construction of major Buddhist monasteries, for example, Nalanda and Vikramashila, both in present-day Bihar state. This area also saw the beginnings of Mahayana and Tantric forms of Buddhism, in which the Buddha's austere message was overlaid with many magical images. 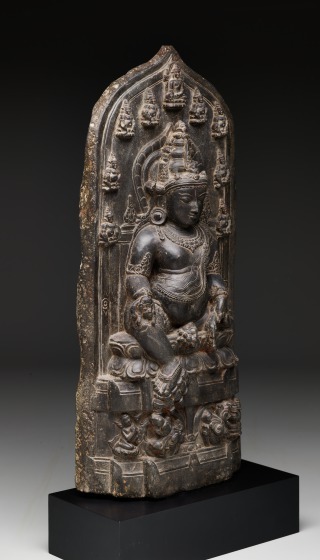 Hindu deities were often adopted into Buddhism, too. 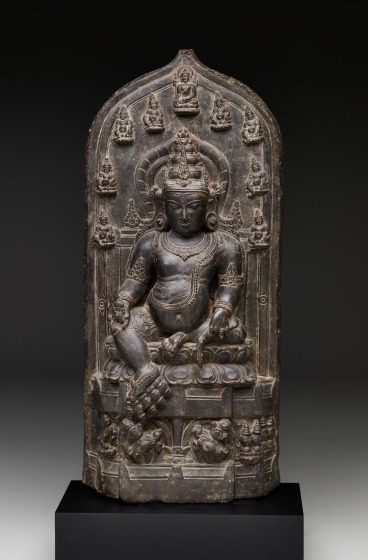 This Hindu-Buddhist mixture was to become very important in the arts of the Himalayas. Frederick Asher, "Jambhala" in The Arts of India, South East Asia, and the Himalayas, Anne R. Bromberg (Dallas: Dallas Museum of Art; New Haven: Yale University Press, 2013), 68. Anne Bromberg, DMA unpublished material, 1995. 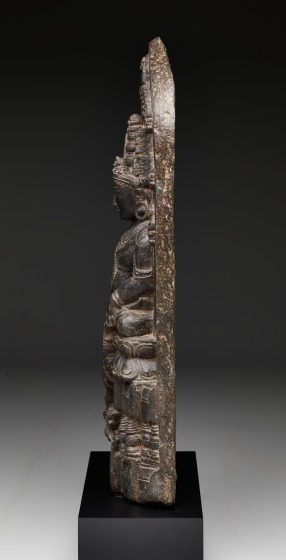 In contrast to the temples of central and western India, where sculptures were part of the structure of the temple walls, sculptures from east-Indian temples were freestanding. In eastern India, temples were made of brick, probably because the sandstone used for temple construction in central and western India was not available there. The stone most commonly available is basalt, but the sculptures of eastern India are carved from phyllite, almost all of it quarried at a single location in eastern Bihar state and transported widely across eastern India and into Bangladesh.